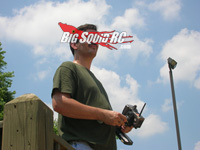 ASK Cubby, 03.12.2014, Version- Good Questions, Questionable Answers « Big Squid RC – RC Car and Truck News, Reviews, Videos, and More! As a result of being addicted to the site i purchased a halix on black Friday. i followed most of the upgrade (BTW thanks for the free advice) series with my own little twist of course and i love shredding just about any surface with the thing but out of curiosity what brand and size 3s battery does the street team prefer? i’m still running the stock electrics, wanna try and burn them up so i can upgrade. Cubby- Yo hey Dominic, congrats on hit’n the big time, shoot us your snail mail for the hook-up on a BSRC sticker pack. Also congrats on the Vaterra Halix. Yes, they need a couple of upgrades out of the box, but once those are done it is an epic bash truck. It is loads of fun to wheelie, do standing backflips, and to sail over huge jumps. During our initial testing we used a Dynamite Speedpack 3S 5200. We had a couple of them and they worked well for us, putting out solid power with good runtimes. Because it has been a while, I’m not sure if they still sell the pack we used, so I am going to suggest This Pack. That is one of the newer “red case” 50C 3S 5000 Reaction series LiPos from Dynamite. While we haven’t reviewed any of them, I have used a few on my personal trucks and they have worked well for me. Have fun, go fast, and shoot us vid of your Halix a couple of stories up in the air. Holler from the city of Chicago. We’re close neighbors. I’ve frequented the local hobby shops finding your print publication along with a few familiar faces behind the counter. I ask this. I’m looking to rejoin the world of r/c without the class regulations, weight limits, and setup sheets ranging by humidity in the air. A decade has passed since my days of the worn in carpet lines of the 1/12 pan cars. I’m looking at the Losi mini 8ight buggy or 8ight T. A RTR option that gets me trigger time on the dirt as fast as possible and a car I’ll want to keep. What’s your suggestion? Oh, and Cubby….your stash is way out dated. Grow that beard. Cubby- Hey now Ryan, don’t forget to shoot us your snail mail so we can hook ya up with a genuine BSRC sticker pack. First up… I think I answered this question a few weeks ago. Both the Losi Mini 8IGHT buggy and the mini truggy are outstanding bash machines. If the area you drive in is small, go for the buggy, but if you have more room pop the extra cash on the truggy. Both are fast, both can take a beating, but we give extra points to the truggy because you can bolt on normal 10th scale buggy wheels. Second up… props on hitting up your local hobby shops to get your hands on BigSquidRC Monthly. While we still have a long ways to go to be in every hobby shop in the country, we are already in a heck of a lot of them. Hopefully you picked up the monthly and some tires/Deans plugs/paint/etc while you were there. Lastly… little do you know that the Pornstache never, Ever, goes out of style. I can’t believe you made it to the end of yet another ASK Cubby. Shoot your emails to Cubby at BigSquidRC dot com where one of my interns will sift through the mess and might even forward your email to where I will see it. Everyone that hits the big time gets a BSRC sticker pack, while one of you really lucky dogs will win a BSRC t-shirt when I proclaim your email as “Letter of the Month”.